Sun-N-Fun Mobile Homeowners Association, Inc.
Our 4,800 square foot air conditioned clubhouse is always bustling with activities: Exercises 3 mornings each week, card games 5 nights a week, bingo twice a week, dances once a month, special meals, choir practice, a computer, pool table and lending library. We have a beautiful swimming pool with plenty of lounge chairs for sun worshippers along with a large covered area to beat the heat or perhaps read a book in the shade. Enjoy a weekly golf scramble or golf daily on your own at our FREE 9-hole executive golf course (open to our homeowners, RV’ers, renters, and guests) Enjoy our four (4) lighted shuffleboard courts. 192 of our folks enjoy friendly competition each week on the six (6) Bocce Ball courts. Additionally we have two (2) horseshoe pits and friendly competition of pickleball. The Community Club hosts our New Year’s Eve party, Valentine’s Dance, Super Bowl Party, Easter dinner and many special meals. Click the "For Sale & Rent" link in the box on the right to view "Homes for Sale", "Lots for Sale" and "Homes for Rent". The sales and rental postings are all sortable by the top fields, for instance if you want to look at listings by order of price just click on the “price” field and it will list them in ascending or descending order. If you want to see the lot numbers in order just click on the “unit/lot” field. If you know a specific lot number simply enter it into the search field. Questions/changes/removals contact carolevan@mchsi.com. Looking for an RV park in the Fort Myers, Southwest Florida area? 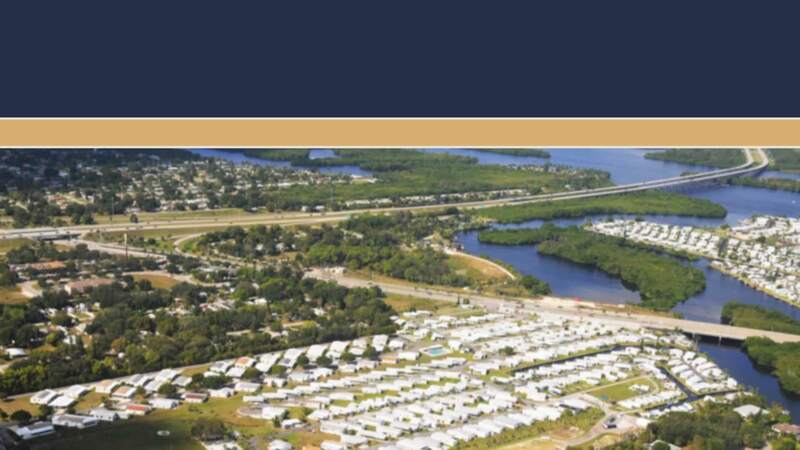 RV rental: To inquire about RV lots available for rent (some are on a canal with boat docking privileges), send an e-mail to: sunnfunoffice2@gmail.com or call Dena at the office at 239-694-5536 Tuesday - Friday 10:00 AM - 2:00 AM or leave a message. Come enjoy RVing for the winter season or year round. Sun-N-Fun RV park is an over- 55 pet free RV area conveniently located off I-75 at exit 141, Fort Myers, southwest Florida. We have 39 RV lots with a boat launch directly into the Orange River leading to the Gulf of Mexico. There is plenty of parking and a storage area for your boat (subject to availability) Enjoy fishing and observing the Manatee’s from our fishing dock. Our RV sites offer both 30 & 50 amp. hookup, water and sewer (RV's must be self-contained). During the season, we have as many as 500 residents enjoying our amenities. Our seasonal residents include several RV’ers who have been enjoying Sun-N-Fun for many years and mobile home owners who have their second home in Sun-N-Fun. We have over 60 year round residents. The RV park is open year-round with shopping and flea markets nearby. Fun-filled Ft. Myers Beach and beautiful Sanibel Island are only 25 miles away. The white sands of the beaches in Bonita Springs are just one hour away. All Park Facilities Available to Our RV Park Guests. The RV section of our park also has plenty of parking and a nice laundry facility for your use while staying with us. You will have access to all park facilities ie: free golf course, free boat launch, fishing pier, clubhouse activities as well as being able to participate in our many social events such as bocce ball, shuffle board, swimming, chorus, exercise, field trips and many others. Check out other rv parks in the area and compare what we have to offer along with our reasonable rates..... and you'll be pleasantly surprised! Many of the RVers visit us then make our RV park their second home. Non-refundable deposit required 1st month, all other months due in advance on 1st of mo. Rates are for 2 people per unit. One person must be at least 55 years of age and the other needs to be at least 45 years of age. Homes for Sale: No need to register if you simply want to look at homes available for sale in Sun-N-Fun, click on the "For Sale & Rent" link above to view Homes for Sale and Lots for lease. Click "About" to return to the home page. To receive a copy of all homes for sale and lots for lease, send an e-mail request to sunnfunoffice2@gmail.com or call the office at 239-694-5536. After hours and Saturday - Monday, send your request to: carolevan@mchsi.com. Lots for lease: Several nice 99 year lot leases are available ranging from $15,000 - $20,000. Contact sunnfunoffice2@gmail.com or call the office at 239-694-5536. RV rental: To inquire about RV rental spots by the day, week, month or season, send an e-mail to: sunnfunoffice2@gmail.com or call the office at 239-694-5536. How to Register: Only check owner if you already own your home in Sun & Fun also list your SNF address in parenthesis (# and street). If you are renting a home or an RV spot in SNF, check the box "renter" and list your SNF address in parenthesis. All others e-mail carolevan@mchsi.com. SNF owners and renters, be sure your password meets the requirements listed (Your password must contain one capital letter, one lower case letter, one number, one of these special characters ! % $ & ^ * ( ), and be a minimum of eight characters in length.) and be sure to hit SUBMIT at the bottom left. After you complete registration, send an e-mail to carolevan@mchsi.com to expedite your registration.